The EL6632 PROFINET IRT controller terminal offers the complete RT (real-time) or IRT (isochronous real-time) functionality and a wide range of diagnostic options. All services in accordance with Conformance Class C are supported. Depending on the cycle time, up to five PROFINET IRT or up to 15 PROFINET RT devices can be operated at the EL6632 in a line topology. 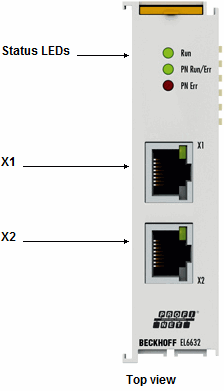 The maximum distance between two devices is 100 m. Protocols such as LLDP or SNMP can be used for network diagnostics. PROFINET For further PROFINET products please see the system overview.